After seeing how easy it was to make paper beads I decided to make a paper bead necklace for a Christmas gift. See my post paper beads for the how to on making the beads. I already had some beads in my stash which I added to the paper beads I had made. I used my Cameo to cut out a charm from card stock. 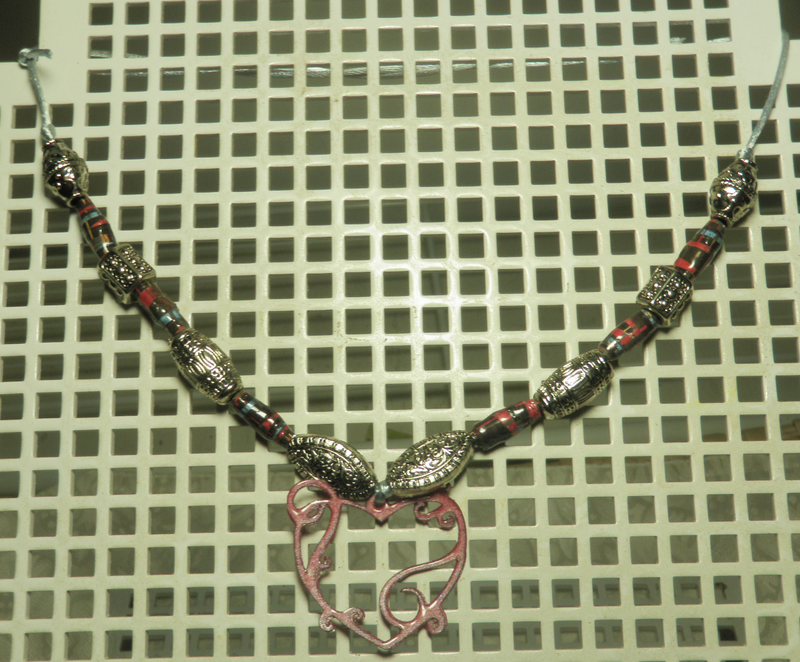 This necklace was so easy and quick to make and no special jewelry making equipment. The charm I cut out is a free cutting file by Mrs. Miles also known as Barb Derksen. Thanks Barb for so generously sharing this swirly heart. (Her free files can be found here) The card stock was actually redder in color with a sheen but changed color when I melted Ultra Thick Embossing Enamel over it. It is easy to make your own charms. I did with this one cut two charms out and glued them together for a little more stability. Stamp the charm with embossing ink and pour the embossing enamel over and melt with your embossing tool. These beads I cut from a plaid scrapbook paper I had on hand. I coated them with two thin layers of Mod Podge but didn't like the brush strokes showing or the finish. The bead was on a toothpick so I decided to roll it over the embossing ink pad. Then I poured out some of the embossing enamel powder. I poured the powder into a glitter tray but if you don't have one a sheet of paper will work. I rolled the bead through the enamel powder and then melted it with my heat tool rotating the bead as I heated it. It was easy and no messing with melting the UTEE as it is called in a melting pot. If you don't have clear UTEE you can use regular clear embossing powder but it will take more coats. The silver beads I have had in my stash for a couple of decades. I did see some similar beads for 20 cents a piece recently in a bead shop. I bought a yard of the cord for 35 cents but the price will vary. You should be able to find the cord for under a dollar. The clerk at the bead shop where I bought the cording showed me how easy it is to knot the cording to make an adjustable necklace. If you don't know how Here are instructions for making a simple knot. 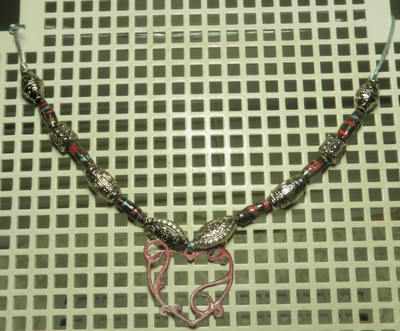 Of course there are fancier knots you can make for making an adjustable necklace. Alas bead stores seem to be going out of business. I went earlier this week to a neighborhood where I used to buy beads and the store was gone. My local bead store is closing which is a shame as it was within walking distance and beads and cording was considerably cheaper than in craft stores like Michaels. I am going to have to walk over there and stock up on cording and beads. That is all for today. One more gift made and the books are bought for the grandchildren. I may actually get gifts mailed out the first of the month instead of mailing them at the last minute. Thank you for stopping by and do come back. 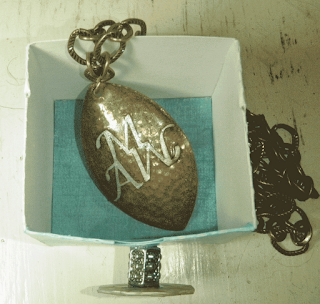 I'm off to make a box for the necklace. Wishing you Happy Frugal Crafting till we meet again. I just finished making a dresser for Ali. I wanted something special to put the jewelry in that I have made for Ali for Christmas. When I saw the 3 drawer dresser in the Silhouette store I knew it was perfect. This is the second one I've made. I messed up the first which was made with white card stock and covered with paper. I thought I would use Mod Podge to coat it so it could be wiped down. For this one I used my plastic coated glitter paper. I must have gotten a good blade because I didn't have to double cut the card stock. Only thing I don't like is that the fold lines are ugly. I will find my Stazon teal ink and ink the edges or buy some washi tape for the corners. For the drawers I coated the front with Gesso which I had mixed soap dye in. Next time I'll use fabric dye or something else. Only because the dye is water soluble and so when I put Mod Podge on the drawers it was acting like a paint and smearing. I did get some interesting looking drawers though. Although this dresser has finger holes for the drawers I thought it would be easier for Ali if she had knobs to pull open the drawers with. After much thinking I came up with these. I saw this pattern when looking through my images and thought it would be perfect for knobs. I printed and cut them out. Then glued three together to give the knob substance. Then heat embossed with Ultra Thick Embossing Enamel. I glued a bead for the knob shank. These are stickers which I have had for a few years. I attached them to card stock and then cut around them. I used strips of card stock to glue them on top. Don't overlook stickers you may have on hand or overlook stickers at a dollar store as they make nice embellishments when stuck on card stock. I happened to have these left over beads from a project a few decades back and thought they would make excellent shanks for the knobs If you are going to make knobs like these use a good adhesive to glue the bead on. For these I used E6000. As you can see the drawers are a good size. In fact I'll have room to put other small gifts in for her. I already found at a dollar store a small plastic purse with lip gloss in it. After the Holidays are over I'll be making more of these dressers for putting craft things in like buttons and brads. I think they will be cute in my crafting area. That's all folks for now. Off to make more gifts and finish cards. Thank you for stopping by and do come back. Wishing you Happy Frugal Crafting till we meet again. When I saw this free file provided by Debbie who is the administrator of Silhouette Plus and is the blogger for Paper Pulse I knew that I had to use it. Her file was for the card base and the pop up tree part. 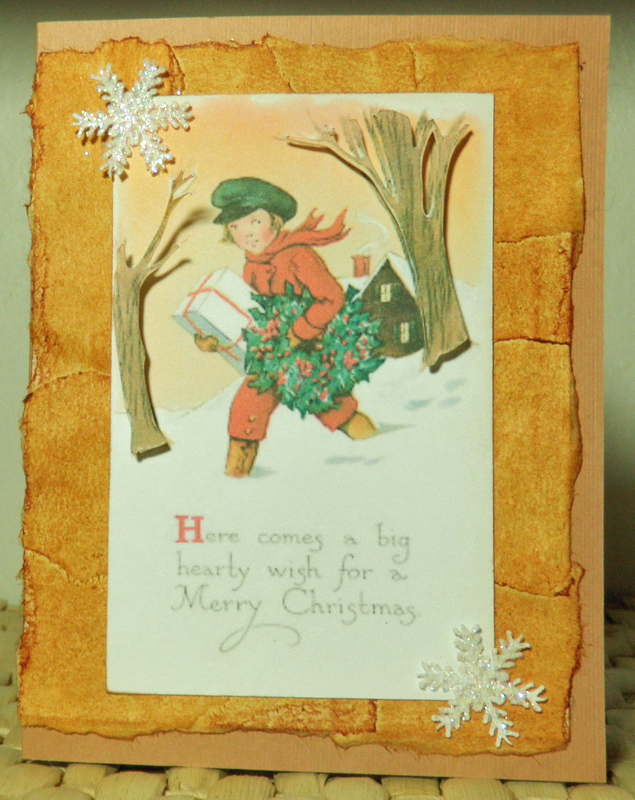 The front of the card is from Christmas Cheer Coloring Book by Dover. I added the text in Studio. Then took the flourishes from a Christmas card kit I bought last year and filled it in with green and turned off the cut lines. I copied the Dover image and set it to cut out the ornament separately. The gold on both the ornament and background is painted with gold water color paint. This is the first time I used a water brush and the first time painting a print without the ink smearing. 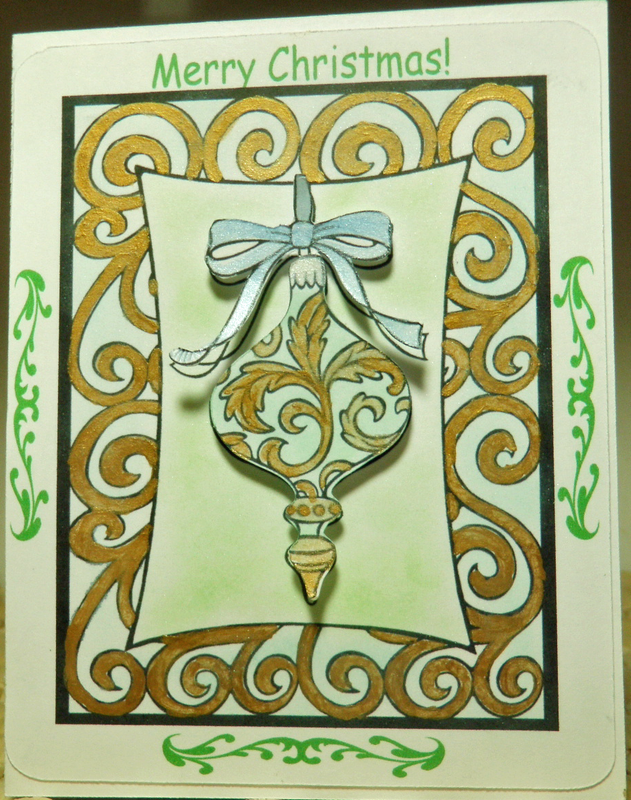 I chalked over the paint on both the ornament and background. As well as the white panel the ornament is on. I pop dotted the ornament over the printed image of the ornament. I painted the tree using extreme glitter paint. Before the paint was totally dry I went ahead and carefully popped out from the back the cut out sections. It is a good thing I did as parts of the cutout sections were sticking together and I don't think I would have gotten them apart when the paint was dry. The ornaments were cut out of scrapbook paper. They are a Studio freebie which I just deleted the cutout sections on them and of course resized.. The gold balls were cut out of a scrap piece of gold. I went ahead and decided to chalk the background. It was fun to craft while listening to Christmas music. I love Christmas even if there does seem to be a lot to do and every year I keep telling myself I'm going to start earlier and I never do. I do now have the front of all the cards done up and just need to add sentiments inside which shouldn't take me long. I should next week get the cards I mail in the mail. Usually I mail them on Black Friday but with Thanksgiving coming early this year I'm a little behind. 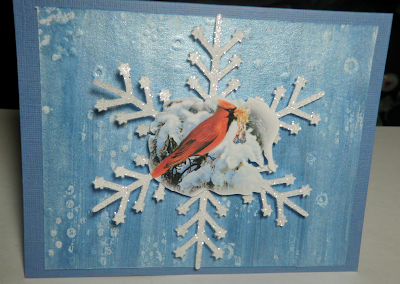 This card has to wait until I finish making presents to go in a box for my son and his family. Hopefully I'll get things finished and the box along with this card in the mail by the first week in December. Thank you for stopping by and do come back. I'm off to start work on a 3 drawer box by Lori Whitlock to put some jewelry in for a granddaughter. Oh the shame. I totally forgot Bug's birthday. She will be two tomorrow. Which meant that I needed to quickly come up with a card for her so I can mail it tomorrow. Although she will get the card late at least she will know that Grandma did not totally forget her. Thank goodness for my Cameo and for Studio. Here is the card I made today. The card is from the Studio library and it must have come with the software. 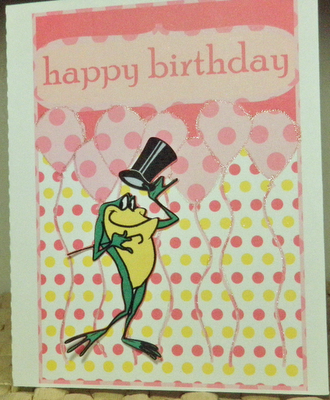 It was originally I think designed to use the happy birthday panel separate and cut everything out. I decided though to turn off cutting lines and fill in with color and pattern. I bought Michigan J Frog last year from the Silhouette store and he was printed and cut out separately. I used my clear star pen to color the strings of the balloon and to outline the balloons to give them a little more definition. Thank you for stopping by and do come back. Right now I'm working on a pop up card and hope to post it sometime over the weekend. 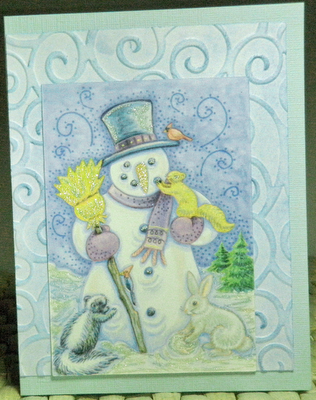 What can I say another snowman card. As well as another Dover image. I don't know what it is about snowmen but I have a thing for them. Well to be honest snow people in general. Perhaps it is because I fell in love with Frosty the first time I saw him on television. Or perhaps it is because growing up there wasn't a lot of snow but when there was my sister and I would attempt to make a snow man. I say attempt because usually there wasn't really that much snow. Originally I wanted to cut the snowman and animals out as one piece but after two hours of hair pulling I gave up. I even tried to extract him using Photo Shop as well as erasing the background. 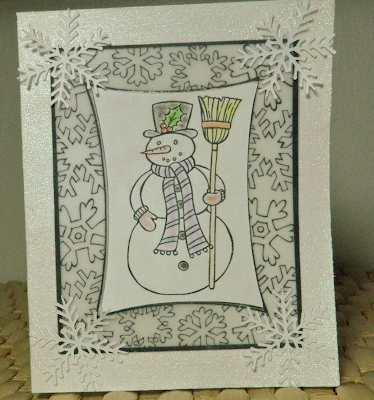 The panel the snowman is on is embossed using the Divine Swirls embossing folder. Since I did a print and cut on white card stock I went ahead and cut the panel out at the same time. 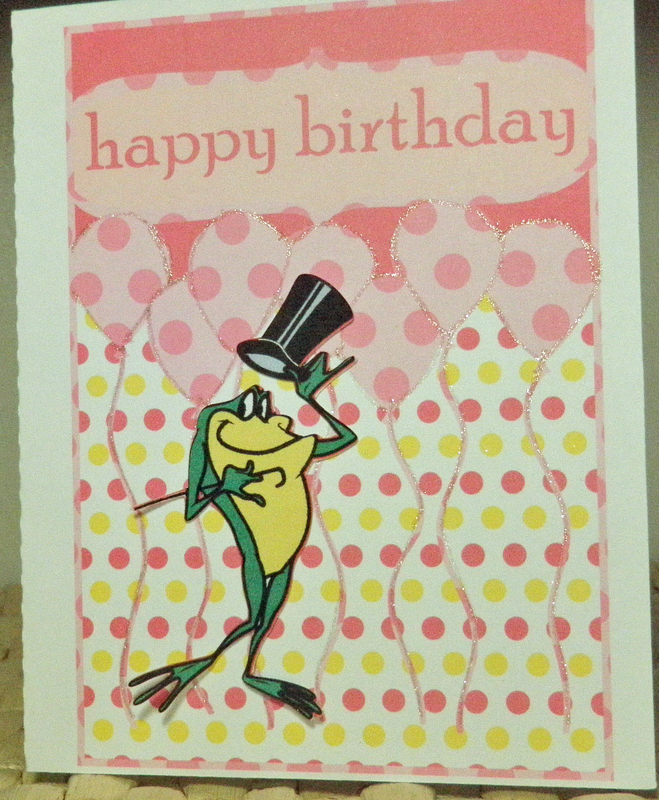 I used my metallic chalks to color the card stock after it was embossed. I felt like the blue was a better match than my regular chalk. Don't you love how the embossed panel echos the background in the image. I thought of just taking my swirl stamps to do a background but decided that the embossing would give the card more texture without a lot of extra bulk. I think I can mail this without having to add extra postage. I used my clear star Jelly Roll pen on the image in different places to give it that snowy/icy look. I decided to just do the buttons on the snowman instead of coloring his body. In the snow I basically scribbled to give it more of a dimension. Anyway it was a fun way to spend time indoors on a blustery, rainy day. From the looks of things I'll have no excuse not to craft as the weather forecast is for more wet weather. I have one more card I'm working on. No,it is not a snowman. LOL! Also I need to get busy making gifts,boxes,etc. Of course I also bought a new toy and stamps so want to play with those. Thank you for stopping by and do come back. Wishing you a Happy Thanksgiving if you live in the US. Also wishing you Happy Frugal Crafting till we meet again! When I was looking through images for a certain image I came across this image offered by Cajoline for free and knew that I just had to use it. These children are so precious. Also I find the background shape intriguing to say the least. Although it was a little bit of a challenge to trace for a print and cut the way I wanted it to cut it was worth it. I am a lot more pleased with the decorative cut outs then if I had just traced the edge. The image as I said is a Dover Publication image. I edged it with Peeled Paint Distress ink using a cotton swab. I like edging vintage images because I feel like I don't have to be exact. I went and dotted red extreme glitter paint on the holly berries. There you have it my elegant vintage Christmas card. LOL! Now to figure out who to give the card to. There are several people on my card list who would love to have it. Thank you for stopping by and do come back. I have two more cards in the works and I'm working on a paper bead necklace for one of my granddaughters. Last year I bought a book of stained glass Christmas coloring pages. I had already made my Christmas cards so thought I would scan and use the images this year. I forgot about the book and then found it while cleaning. LOL! Of course I could have saved myself the trouble of scanning in the snowman image as Dover Publications offered it as one of the samples this week. Although I printed it on vellum it could be printed on a transparency. I did print the snowman on white card stock. 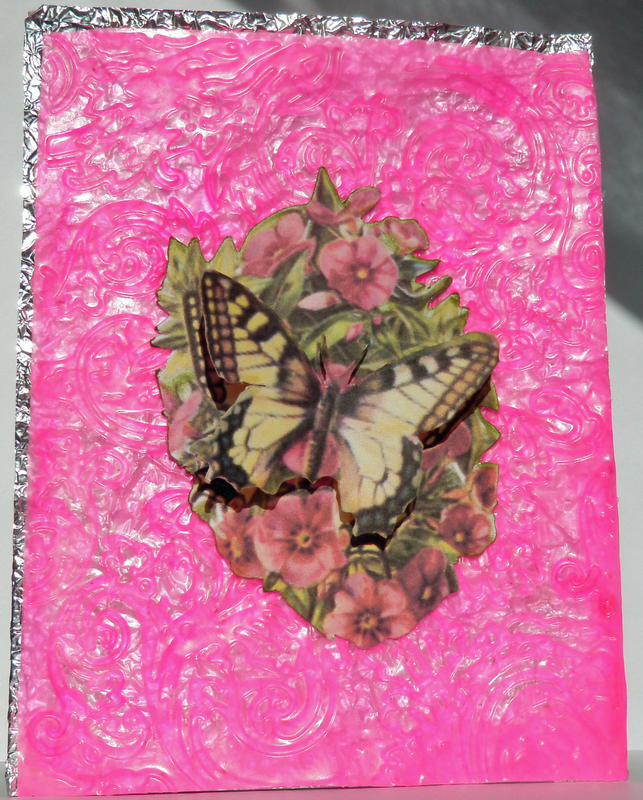 The card base was painted with Folk Art Extreme Glitter Hologram. It was too pinkish looking and I was going to put another coat on but accidentally picked up my patio white paint. I didn't realize I had used the wrong paint until I coated over the glitter paint. I went ahead and rinsed out my foam brush and immediately painted the Hologram over the white paint while it was still wet. I love the way the card base turned out. The image is from Dover as I mentioned. I traced the snowman part so I could cut it out of card stock. The whole image is printed on vellum. Although I'm not sure you can really see in the picture I rubbed white metallic chalk over the vellum. 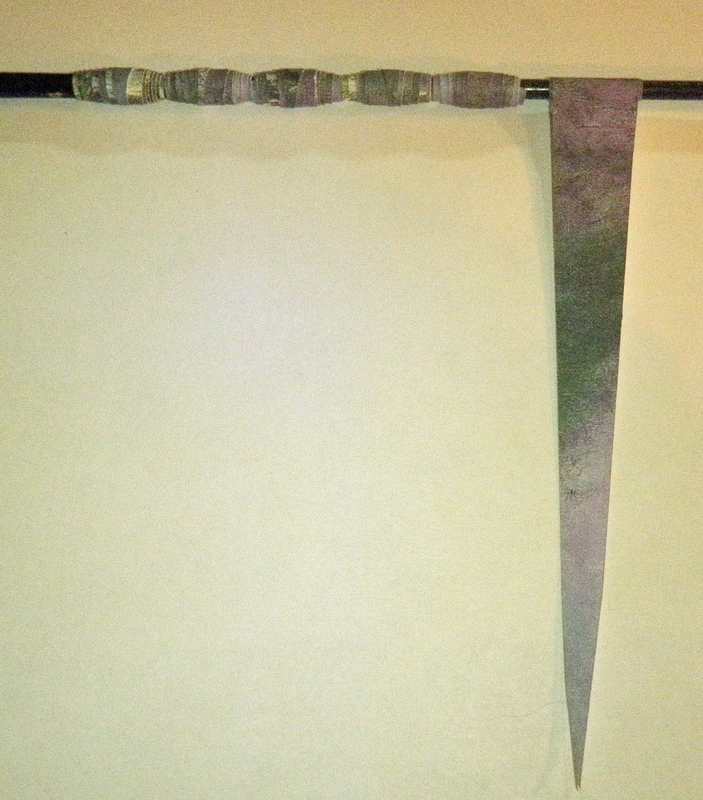 It did give the natural vellum more of a white color. I used metallic chalk to color all but the red berries and the black eyes and mouth on the white card stock. I used color pencils on those and went back and use the black color pencil on the coal buttons I then went and wiped white chalk over everything. You really have to look hard though to see the sparkle. The snowflakes are a Silhouette free file. I was going to paint and glitter them but changed my mind. I also decided to make them larger than I had originally planned. The snowflakes hide where the vellum was glued to the card base. 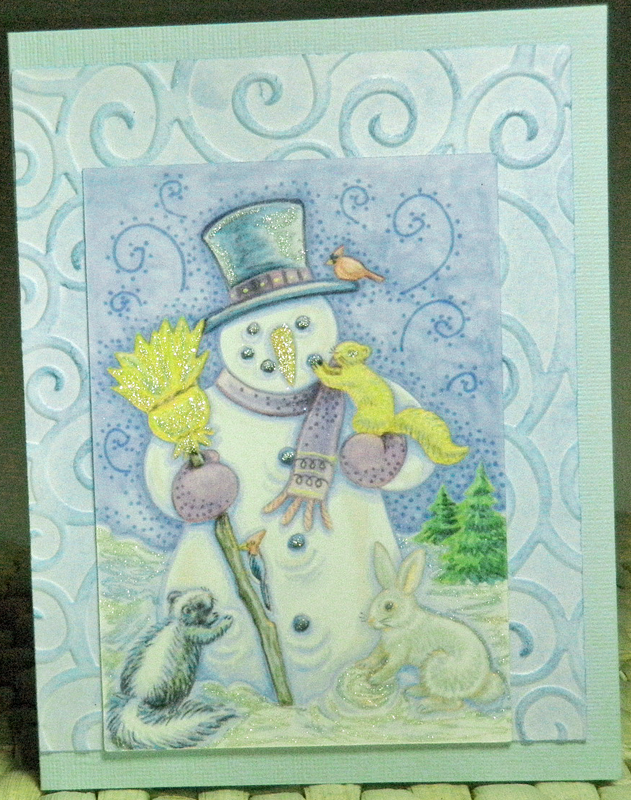 As does the card stock snowman panel. I am disappointed with the Inkadinkado Metallic Chalks. I love the colors but at least on light color card stock or paper they don't have the Metallic shine that I was expecting. I will later on see what happens using them on dark paper. The colors are different from my other blending chalks so it does give me more colors to work with. Also they are easy to work with using either the poms that come with it or something like Fantastik. That all folks! Thanks for stopping by and do come back. My roommate asked me a couple of months ago to make paper beads so he can make his mom some jewelry for Christmas. Well, I must confess that for two months I've had the cutting file made. My excuse for not making them sooner is I could not find the paper. With Thanksgiving next week I knew that I really needed to make the beads if he is going to get his present made for his mom in time. Lol! As luck would have it the paper I wanted to use was with the other papers all along. So today I cut out the paper and started rolling my beads. This goes really quick and you could make a lot of beads in a short time. You are going to need to cut your paper into a triangle shape. 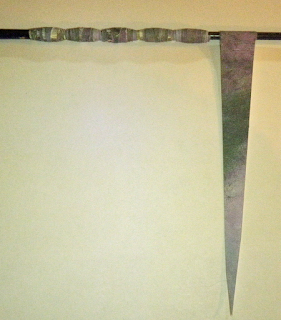 The width and length of the triangle will determine the diameter of your finished bead. I made mine .75" X 6". The .75" is the squared off end of the triangle which tapers down to a narrow point. This is what mine looks like cut out. I am using some Monet Waterlily scrapbook paper I found on sale over a year ago. Pretty much any paper would work as long as it rolls nicely. If you are using a program like Studio for the Silhouette cutting machine you could fill in your triangles with pattern and make them print and cut. I am using a paint brush to roll the paper on. A skewer would work, a thin dowel or whatever you can find. Remember the diameter of what you roll the paper on will determine how big your hole is for your bead. To make the beads you will need a glue stick. To start your bead spread glue on the squared off end on the pattern side. It is important that you put the glue on the pattern side as you don't want the bead to stick to what you are rolling it on. (Wonder how I know that. LOL!) Then tightly roll holding it a moment for the glue to stick. It should look like a pennant on a stick. All that is left is to finish these beads with some kind of sealer. It depends on the effect you want. You can use clear nail polish which is quick and easiest way. Leaving the beads on what you used to roll them on will make that easier to do. They can be dipped in Ultra Thick Embossing enamel which will have them looking like glass beads. They can be sprayed with a polyurethane sealer. You will want to seal your beads some way. I can't wait to see what my roommate makes. He wants to add some amethyst beads along with these. I was going to cut some triangles out of metallic paper for beads to go with these but he said no. Thank you for stopping by and do come back. Word art is trendy right now and although I have thought of doing a word art project I never have until now. Over at the Silhouette Plus Forum one of the members posted a link for Tagxedo. The Tagxedo Creator allows you to create word art in shapes. Here are the cards I made after playing with Tagxedo. The diagonal background is decorative card stock by The Learning Tree which I purchased at Dollar Tree. The frame was cut from glitter card stock that reminded me of Christmas ornaments. After saving the tree in Studio I did a trace so I could have Cameron cut it out tree shape. I did a little bit of point editing and could have done more but I think it has charm. I pop dotted the tree onto the panel. The blank card was the perfect color. Taking the same words but using a different font,shape,and theme I came up with this. I know this is non-traditional Christmas colors but I loved the way the colors looked when I was playing. Besides I have all of these card blanks in the burnt orange color to use up. I cut a panel out of a scrap of metallic card stock. 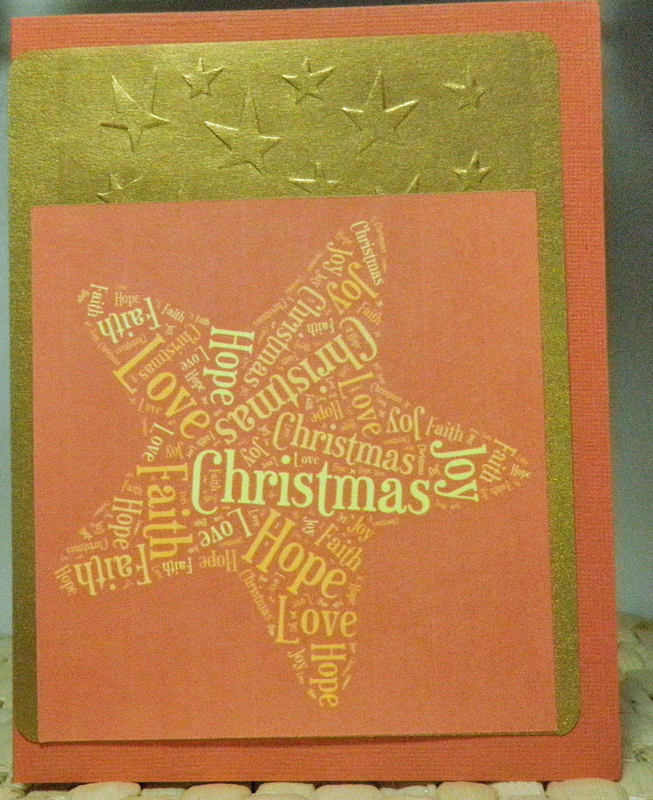 Then embossed the top section with Sizzix's Dancing Stars embossing folder. I only wish the folder was a little wider because if you look carefully you can see the metal plate edges. 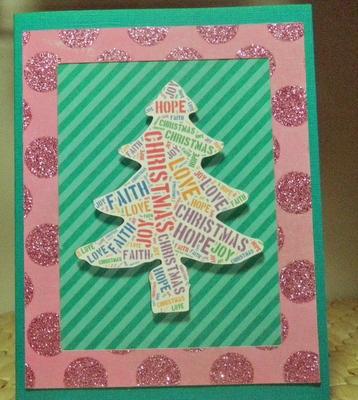 Two quick and easy cards using word art. One word of caution it can become addictive playing on the Tagxedo site. Thank you for stopping by and do come back. 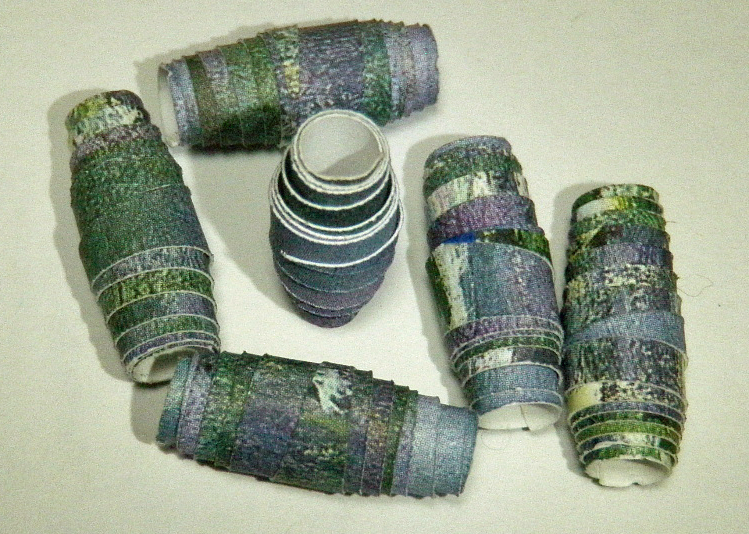 I am planning on making paper beads this week and hope to have them posted soon. I really need to get busy again crafting for Christmas gifts. When I saw this image this week as part of Dover Publishing Samples I knew I had to make a Christmas card with it. If you have not signed up yet to receive a weekly email with the link for samples you really should. It is a great way to get images to use in crafting. There is a real variety of images. Originally I had wanted to cut out the boy and have him pop dotted. However it ended up being too complicated for me to figure out how to do it in Studio. I really did not want to cut out by hand. Anyway after looking at the image I realized that it probably would not look right. 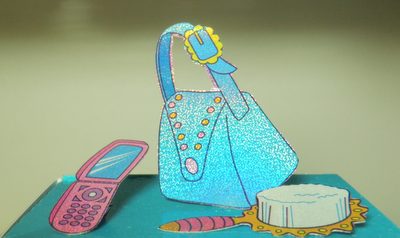 The background was made by cutting out card stock. Then tearing bits of calligraphy paper which has been hanging around unused for years. Then I glued my torn pieces onto the card stock. When the glue was dry I rubbed tea dye distressed ink over it. The image came from Dover Publication. I made a copy of the image so that I could trace it to cut out the trees. I had to do a little bit of playing around to get the one tree to cut right. I pop dotted the trees over the trees in the image. Originally I cut out four snowflakes but decided to go with the two. I had brushed twinkles glitter paint on them and then sprinkled a fine glitter on them. I am pleased at how nicely the small snowflakes cut out. They are from the free file in the library. I love how the background turned out. I have never done a background like that before. Don't be afraid to try something new. You might be surprised at the outcome. Thank you for stopping by. Do come back again. 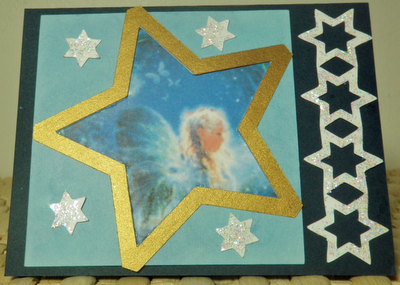 After seeing a card which used a star border die I decided to make my own star border in Studio. Only thing is that once I made the border I was totally clueless with how I was going to use it. So for a month now the cut out border has been sitting around waiting. I had ideas but none of them really looked good to me. LOL! Then while soaking in the tub inspiration hit. I could cut a panel with a star cutout and place an image behind it and use the star border as a border. The smaller star cutouts could be used on the panel. The inspiration for making the file used the cutouts as part of the layout so why not. Originally I was going to use my blue glitter card stock for the panel with the cut out star. However, Cameron my cutting machine was doing weird things. The next best thing was cutting it out of pale blue card stock which I happened to have. I just had to try out my new metallic chalks so I added chalk. The sheen is really subtle. I have no idea where I got the graphic nor where the original one is. This graphic I added the butterflies in a program which is no longer available online. It allowed you to add animated shapes to your static image. The gold star frame was an after thought. After I had glued my image behind the cutout I realized that something was needed. I ungrouped my panel in Studio and took the star and did an external offset. It ended up being a little larger than the panel but I think I like the two edges hanging over. The star border was easy to make using the star in the library. Resizing and offsetting the star and then duplicating and welding the stars together. Originally I was going to heat emboss with gold both the cut out stars and the border. I decided instead to use my Twinkle glitter paint. I really like the contrast it gives. Where do you find inspiration? If you have a cutting machine do you see a file or even a commercial die and think I can make my own file? OK last question. Should I put this card in my generic stash or my holiday stash? It really could go either way. Thank you for stopping by and leaving comments.I have more Holiday/Christmas cards in the works. Ideas were coming fast and furious while soaking in the tub. I really need to have in the tub area a waterproof notepad and pen. LOL! I must confess I do not remember reading Shakespeare's The Winter Tale nor A Winter Tale by Mark Helprin. Nor have I seen the movie that came out in 2007 where a bullet meant for a local drug dealer kills a child. There appears to be a couple of different songs with the title A Winter Tale. Who knows there may be more. Anyway I took these lyrics as my inspiration from the song "A Winter Tale" by Queen. 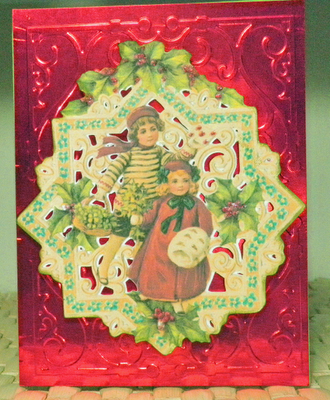 The background panel was embossed using the Polka Daisies texture plate. It was as close as I could come to snowflakes and snow. I then rubbed white crayon over the embossed parts. I thought I had rubbed the crayons well over the embossing but perhaps the cheap crayons weren't waxy enough. I then painted over the panel with blue pearl water color. Taking a paper towel I rubbed the blue paint off the embossed parts. The snow flake was in the Studio library. I sprayed adhesive on it and then sprinkled Martha Stewart coarse crystal glitter on it. Originally I was going to use an image of a village and children playing in the snow but in the small size all the detail was lost. I found this cardinal image and thought it would be perfect. I did use a clear glitter gel pen on the jewels. Thank you for stopping by. I will be playing more with crayons and my pearl water colors. I am a loving these water colors. Also I should get my metallic chalks tomorrow. So hopefully I'll have some cards using those soon to post. I played with different things underneath the glue sheet and finally decided to go with crumpled foil which I glued to the front of the card base. Then I used the white school glue I had used for the glue sheet and brushed it on the sheet. I goofed and put the glue on the wrong side but I think I like the debossed better. The butterfly image is a print and cut. I have no idea where I got it from. I did take it into Photoshop to extract as much as I could of just the butterfly. I will confess that near the top of the butterfly I had to do a little hand cutting after Cameron cut it out. It is attached on top of the graphic with a 3d foam dot. I think it gives the illusion of being in motion. There you have my glue sheet experiment. I do have a folder with words which is too large for the size cards I make and I am going to make a glue sheet with it and then cut the words apart to use. The glue sheet cuts nicely with scissors but I think my trimmer blade is dull as I've noticed lately that even card stock is not being cut cleanly. If you don't mind having an embossing folder out of commission for a few hours I encourage you to try making a glue sheet. I used Elmer's glue but any non-tacky glue which dries clear would work. 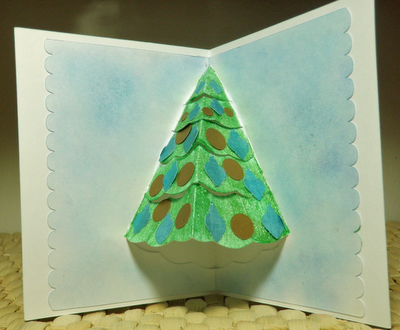 Hint: Spread the glue just thick enough to cover the embossing. If you start to gently peel it off and it is not easily coming off wait awhile longer. I found it was easiest to start peeling near the fold if using a folder. Thank you for stopping by and do come back. I was going to make a card using a graphic that I will chalk with metallic chalk but alas my order of chalk arrived with the chalk broken. So that is on hold until my replacement chalk comes. In the meantime I do have some pearl water colors to play with. 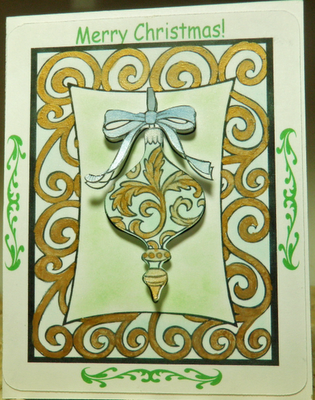 As well as I'm working on a card for the Silhouette Plus Card Challenge.